SEMA wrapped last week and we're still sorting through all the pictures that came our way from friends, readers and sponsors. One of the more interesting shots came from frequent contributor Roger Garbow. 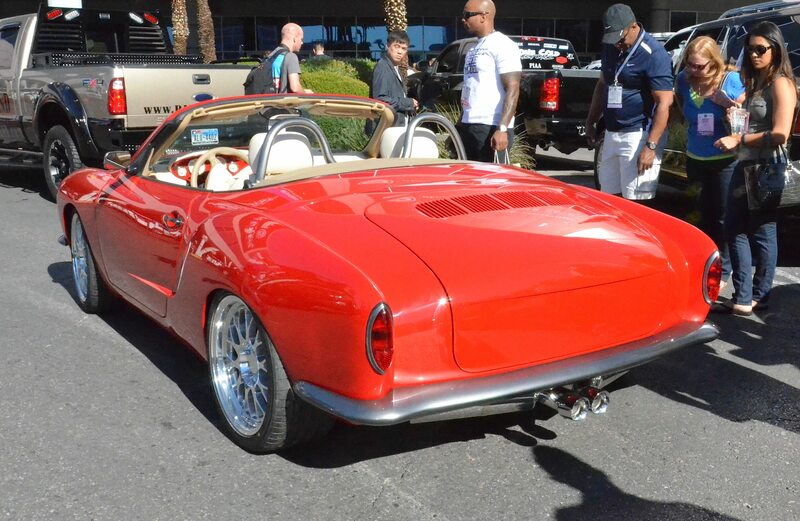 The picture below was taken outside the Las Vegas Convention Center and shows what appears to be a spectacularly restored and updated 1972 Karmann Ghia. 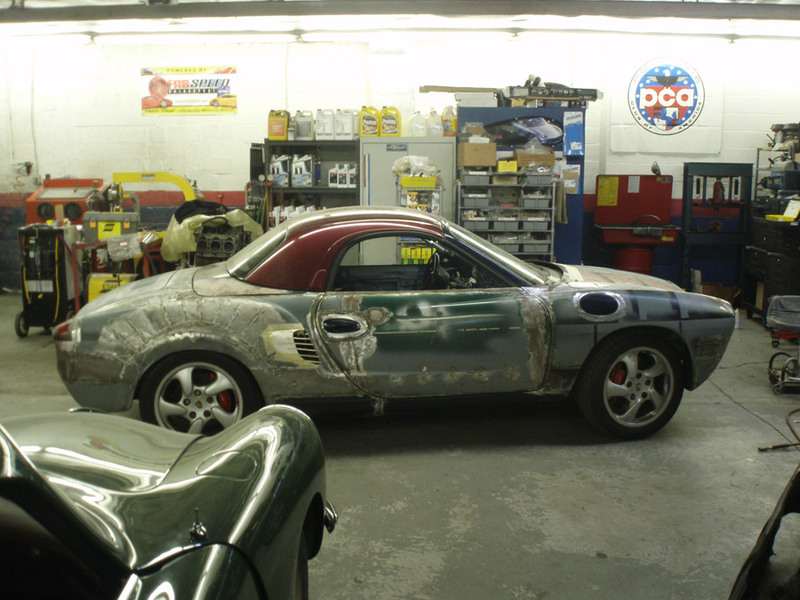 However, after a closer inspection it's apparent that this Karmann Ghia is more than it seems. Porsche restorer, customizer and mechanic Tony Miller of Translog in York, Pennsylvania was commission by a customer to create this one off Porsche-Kharmann compilation. 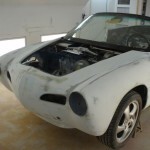 Using a 2001 Boxster S for the chassis and drive-train, Miller widened and customized the body of a '72 Karmann Ghia to fit the Boxster's frame. 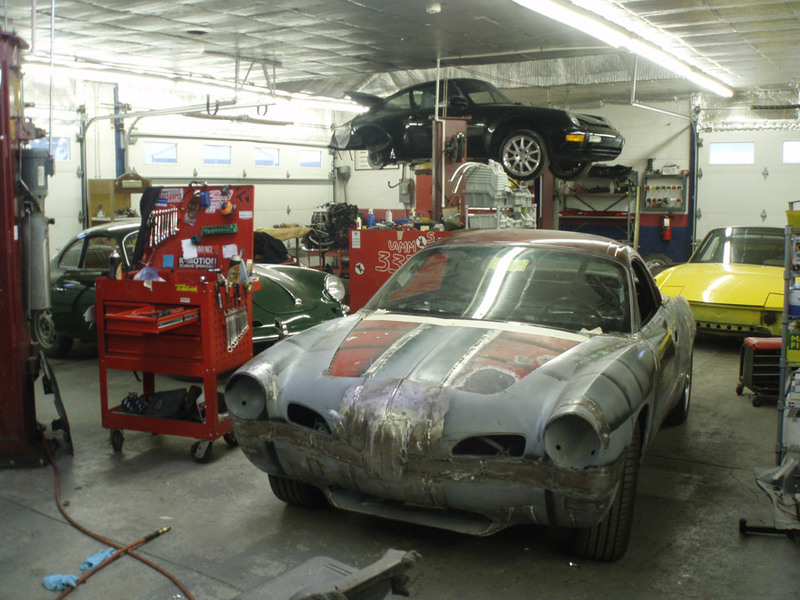 Almost every body piece was replaced during the process. 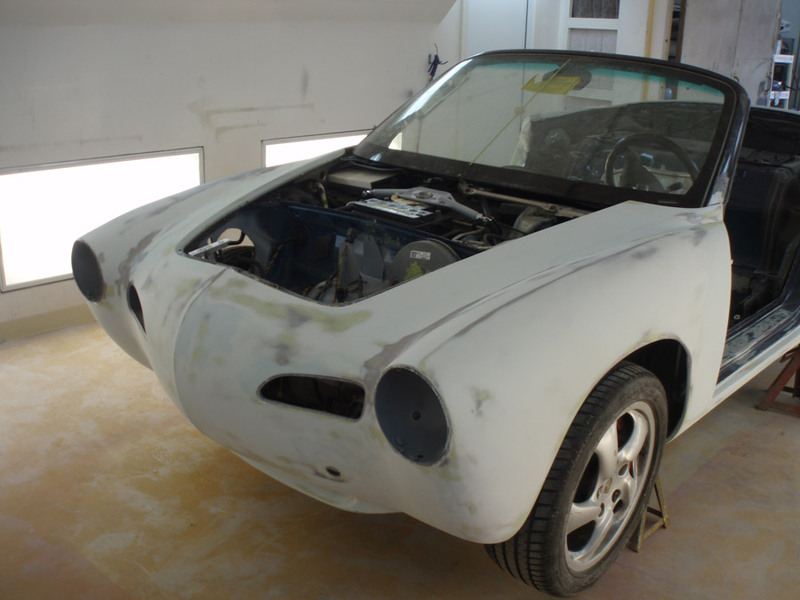 According to Miller, "the only exterior sheet metal we retained from the Boxster was the tonneau cover in the rear and the rocker panels which are integrated in the rear quarter panels and Ghia fenders." While the drive train of the Boxster S remains mostly stock, Miller did swap out the exhaust for one from Fabspeed and the suspension was upgraded with H&R springs. When we asked about how the change in body work and aerodynamics affected the driveability we were surprised to find out they didn't yet know. The car looks so good in the picture above we just assumed it was running. 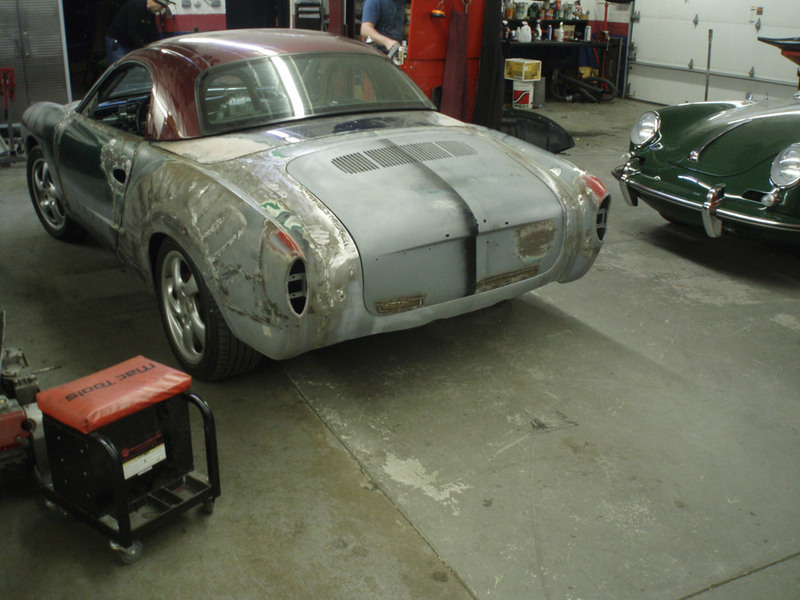 However, Tony tells us it's still a rolling chassis at this point as there is still some mechanical work needed to get the Boxster radiators and condensers modified to fit in the shorter Karmann Ghia body. He expects things to be completed by the end of the year and we should have an update for you then. 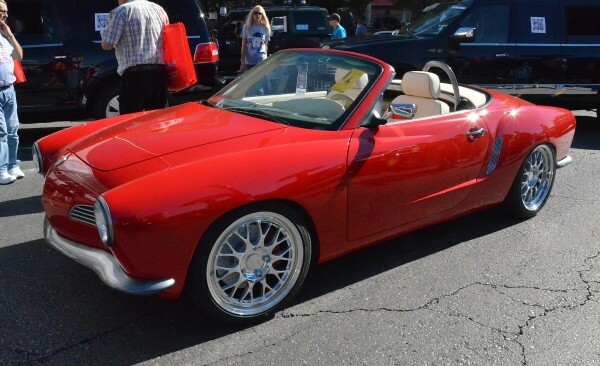 There's not yet a ton of additional information on this customized Boxster/Karmann Ghia on Tony's site, but there are a few more pictures and contact details if you are interested in doing something similar to this yourself. Let us know if you do, we want to write about it! Is it a Porsche? A Ferrari? Introducing the Porschari! God…. you’d think after all these years we can spell it correctly !….. Karmann Ghia !!!….. ( My first car……the “poor-man’s” Porsche that transported me to college). Same “Bahia red”…if I’m not mistaken from the photos. The 912 was the poor mans!! not the Ghia. And 912 ,914 was replaced with the 924-944 line then the current boxer line. The Ghia was originally a Chrysler concept. Nothing to do with the 914. The Ghia was killed to make production for the 914. They were not produced at the same time so how could have the Ghia been the alternative for the poor man? It wasn’t, never was. Jeremy here from Volksamerica magazine. I am interested in speaking with you about your ghia/Porsche. When you have a moment, can you please contact me. The windscreen looks terrible. Other than that it’s great.